There are several ways to view images form the camera on TV, depending on the features of both devices. Please check your manual for supported features. 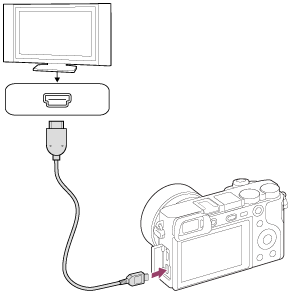 If the TV has a USB jack that supports Mass Storage Devices, you can connect the camera to the TV with the supplied USB cable and playback your pictures. In this case the media player of the TV is used. Also, if the TV has an HDMI input, you can playback the pictures by connecting the camera with an HDMI cable (sold separately). In this case the camera is used as media player. If your camera and TV supports Bravia Sync (or other CEC connection), you can comfortably navigate through your pictures with the remote control of your TV. Options and operations differ depending on the type of connection. Pictures recorded with Adobe® RGB colour space will appear with low colour saturation if the TV does not support the Adobe RGB standard. Older DSLR models (DSLR-A100, DSLR-A200, DSLR-A300, DSLR-A350) feature an analogue composite connection for viewing images on the TV (composite cable included). DSLR-A700, DSLR-A850, DSLR-A900 have both HDMI and composite connection.